Every month or so, Lark arrived at my brother Scott’s tavern wired with the enthusiasm of his latest venture. Tonight, he caught me at the corner of the bar with an armload of dirty dishes destined for the the kitchen. He often picked Lenten Friday nights, our biggest nights, for his super urgent favors. I tried to just say, “Hey” and push past. He blocked me, “I need you to write - .” Of course, he did. Whenever his latest venture needed a bit of writing, he came to me. I leaned an elbow on the brass bar-rail. Four plates of picked over coleslaw, mac salad, sludgy ketchup, and bits of breaded fish bridged the distance between us. Hot on the trail of his latest money maker, I could be on fire and he would still talk about his screenplay (loosely based on his life), or a business plan for reindeer food, or a children’s book idea authored by one of his daughters. Better to listen rather than have Lark follow me into the bustling kitchen where my brother cooked with the crew of teens he employed. Scott had bought the tavern from Lark and one of his many partners. Because Lark once owned the place, he took liberties that annoyed Scott. But then, Lark riled the whole family with his liberties. Family members bought cars from him, but a bit of intrigue always followed these purchases and his continued presence came along in the fine print. He’s been a friend of the family since childhood. My grandparents’ home, this tavern, and sometimes our cars became part of his network of encampments. His pluck, spirit, humor and mischief had grown wearying and worrying in middle age. He still had the twinkle in his blue eyes but he was quickly losing the bounce and abundance of his coppery Irish curls. Age and disappointments mark us all. “Lark, I have my own hopeless writing projects to attend to.” And I did - always do: the great American novel, a screenplay (loosely based on my own life), a website, a children’s book for the kids I always wanted to have but didn’t, and on and on. Annoyed now that I was reminded of my own failed ventures, I decided to make my way around him. Let him follow me. To hell with my brother’s nerves. One of Lark’s merry men saw me trying to depart and got up from his bar stool. They knew there was no sense interrupting when Lark had someone on the line. One or more of these guys, usually nicknamed after a bird or a nut, was at the bar. They were working class guys who for various and sundry reasons hadn’t held a regular job in a long, long time, or ever. They smelled of alcohol, cigarettes, and gasoline fumes from Lark’s tow truck and parking gigs. I don’t know how much money they actually made from these side jobs, but they seemed to rely vicariously on Lark’s bravado more than anything else. As loathe as I was to admit it, with the last name Quale, I fit right in. At 38, I had never worked a full-time job. My latest gig might not have smelled of gasoline but fish fumes clung and stank about the same. I bussed the dishes in the kitchen and hurriedly returned to the bar. His schemes were mostly hopeless, but once in a while he sparked my interest. When I returned, he was seated at the bar with Magpie and Cashew. I tried to get his attention back to the Fenians but he was onto something else. I never did find out what he wanted to do with the money or if Labatts had offered a grant. Reeled in again. When I got home, I looked up the Fenians. Yes, Irish immigrants tried to invade Canada. The Fenian Brotherhood began on St. Patrick’s Day, 1858 in Dublin. Their numbers included American Irish immigrants who had served in the Civil War. 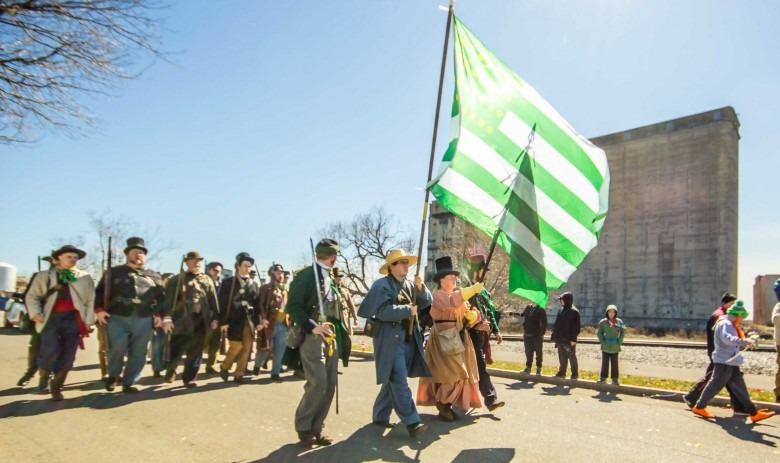 With their experience in battle, many of the veterans joined the Buffalo 7th regiment of the Fenian Army, or the Irish Republican Army. While the money came from the West Side of Buffalo, the forces came from the southside of the city. Their intent was to free Ireland from England by invading Canada. Crazy, right? Did anyone look at a map? Canada’s mighty big for a rogue army of Irish immigrants to be able to successfully invade. Actually, they did catch a ragtag team of volunteer Canadian soldiers off-guard, but still Canada has length and breadth. The U.S. wasn’t going to allow a bunch of Fighting Irishmen to destabilize its borders, especially after the Civil War. But the sudden, and surprisingly successful attack, upset the Canadian government and accelerated the process of confederation. The end result was that in 1867, Canada along with the other British colonies of Nova Scotia and New Brunswick united into the Dominion of Canada. I still don’t get how the Fenians thought an invasion would loosen England’s grip on Ireland but here are some excellent articles on the subject - The Fenian Raid and Battle of Ridgeway June 1-3, 1866 and The Day the Irish Invaded Canada. I may have a mere smidgen of Irish ancestry which my Grandma Betty (her family hailed from County Cork) tried to invoke at every turn. She enjoyed Lark, never wearied of his schemes, nor of mine. She never cared whether his ideas panned out. It was the spirit of the thing. I don’t know how St. Patrick’s Day is celebrated in Ireland or for that matter in the rest of the U.S. I do know how it is celebrated in South Buffalo: Fenian style. You put down your maps and good sense and you pick up your far flung schemes and bravado to create your parade float. Then you march it through town. But, now we stay on this side of the Niagara River. Annual St. Patrick celebrations begins with the annual Civic Luncheon. The Buffalo Irish Center will feature music, dance and food for the weekend.